Things are starting to heat up for James Wan's Aquaman. 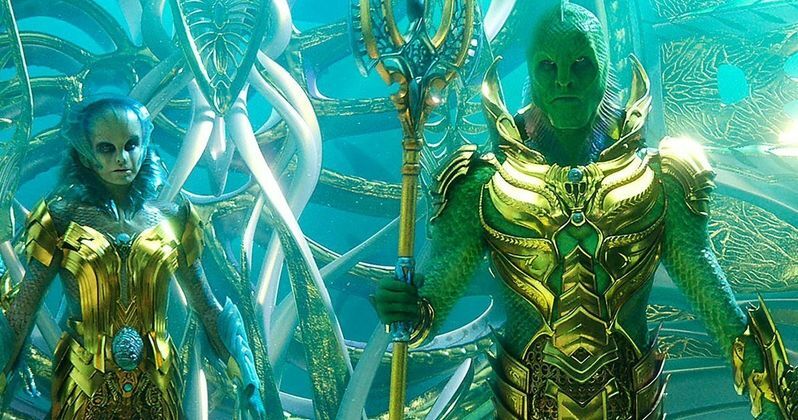 The DC movie has now shared a brand-new image of the exotic Fisherman King and his royal palace, which is one of the seven kingdoms of Atlantis featured in the upcoming live-action movie starring Jason Momoa. Some footage made its debut at last year's San Diego Comic-Con as well as CinemaCon in April of this year, but it never found its way on line, though the descriptions sounded promising, even from early on in the production of the film. DC fans have been waiting for their first real look at Aquaman and the wait is almost over. The new image of Fisherman King with his trident and his royal palace from Aquaman is a far cry from the darkness of Justice League. The coloring is bright with light blues, vivid greens, and striking gold, begging for some more investigation. In the scene, King Orm, who is not shown in the picture, has gone to the Fisherman King to seek help in declaring war on the ocean-polluting surface world. The Fisherman Queen and Princess are on the left, and a royal guard on the right. Aquaman producer Peter Safran shed some more light on what is going on in the new image and the movie as a whole. As it turns out, the Fisherman's kingdom is more evolved than some of the others after the fall of Atlantis, which makes sense when looking at the vibrant image. The Fisherman's kingdom looks to be flourishing, and is more than likely why King Orm sought his help. Some kingdoms weren't as lucky. Safran explains. "After the fall of Atlantis, some of the kingdoms evolved and some devolved. This is one that evolved. This is a kingdom that's primarily artistic and cerebral, with poets and philosophers." Marvel Studios isn't attending San Diego Comic-Con this year, which means that DC will be able to easily steal the show. Aquaman and Shazam! are the big ticket items for next week, but Gal Gadot will reportedly be stopping by with a surprise from Wonder Woman 1984, though it's not clear what that surprise will be. It seems too early for a teaser, but those in attendance could very well get their first look at the highly anticipated sequel. Many DC fans hope that DC will give updates on other projects that are currently in development as well. Aquaman hits theaters on December 21st, which will put it in direct competition with the Bumblebee movie. However, with all of the hype surrounding the DC project, it seems that they'll have no problem taking over the box office on opening weekend. James Wan has indicated that the first trailer for Aquaman will debut at Comic-Con, so keep your eyes peeled for that. While we wait for the trailer, you can check out the new images of the Fisherman King along with the Fisherman Queen and Princess below, thanks to Entertainment Weekly.